Newcastle came from behind to see off 10-man Coventry and move three points clear at the top of the Championship. Clinton Morrison fired in for the visitors, but Wayne Routledge volleyed in the equaliser two minutes later. Andy Carroll's header gave Newcastle a second-half lead and Peter Lovenkrands added a third from the spot after Routledge was fouled by Leon Barnett. Barnett received a second yellow as a result to leave substitute Ryan Taylor to tap in the fourth in injury time. The league leaders began in lively fashion with headers by Fabricio Coloccini and Lovenkrands both going close. But just after the half-hour Coventry broke the deadlock against the run of play when Michael McIndoe crossed from the left for Morrison to bundle the ball home. Their lead did not last long and a weak header by Coventry skipper Stephen Wright allowed Routledge to power in from outside the box just before the break. The hosts kept pressing and were rewarded on 53 minutes when Carroll finished off a fine move by nodding in his eighth goal of the season. The three points were soon made safe when Barnett was given his marching orders after clumsily hauling down Routledge. Lovenkrands blasted in from the spot before Taylor grabbed his late strike. "What Wayne has got is old-fashioned wing play. "You look at him to provide crosses into the box but it is a real added bonus when he comes up with a goal, and it was an excellent one at that." "We got a good goal, we had one cleared off the line and we got in some good positions. "We're a bit disappointed to concede the equaliser so quickly after scoring but for an hour we were in the game. "We knocked off for the second goal and when you are up against that type of quality you will be punished." 90:00+3:06 The referee brings the game to a close. 90:00+1:50 Assist on the goal came from Fabrice Pancrate. 90:00+1:50 GOAL - Ryan Taylor:Newcastle 4 - 1 Coventry A goal is scored by Ryan Taylor from close range to the bottom left corner of the goal. Newcastle 4-1 Coventry. 89:12 Handball decision goes against Andrew Carroll. Richard Wood restarts play with the free kick. 88:36 Patrick Van Aanholt sends in a cross, Header by Andrew Carroll from deep inside the penalty area misses to the right of the target. 87:13 Jonathan Stead gives away a free kick for an unfair challenge on Fabricio Coloccini. Fabricio Coloccini restarts play with the free kick. 86:55 Aron Gunnarsson takes a shot. Save by Steve Harper. 86:07 Centre by Danny Simpson. 82:57 Jonathan Stead concedes a free kick for a foul on Danny Guthrie. Free kick taken by Steve Harper. 81:49 Substitution Ryan Taylor joins the action as a substitute, replacing Wayne Routledge. 81:49 Substitution Jonas Gutierrez leaves the field to be replaced by Fabrice Pancrate. 80:08 Kevin Nolan produces a left-footed shot from close range which goes wide of the left-hand upright. 78:55 Sammy Clingan has an effort at goal from outside the box which goes wide right of the target. 78:11 Wayne Routledge sends in a cross, Richard Wood makes a clearance. 76:26 Patrick Van Aanholt restarts play with the free kick. 76:26 Booking Aron Gunnarsson goes into the book for unsporting behaviour. 76:03 Foul by Aron Gunnarsson on Jonas Gutierrez, free kick awarded. 73:24 Sammy Clingan challenges Mike Williamson unfairly and gives away a free kick. Steve Harper takes the direct free kick. 71:31 Substitution Leon Best on for Peter Lovenkrands. 71:13 Andrew Carroll is caught offside. Stephen Wright takes the free kick. 69:11 GOAL - Peter Lovenkrands:Newcastle 3 - 1 Coventry Penalty taken left-footed by Peter Lovenkrands and scored. Newcastle 3-1 Coventry. 68:35 Sent off Leon Barnett is sent off by the referee. 67:58 Assist on the goal came from Wayne Routledge. 67:54 Unfair challenge on Wayne Routledge by Leon Barnett results in a Penalty. 67:07 Aron Gunnarsson concedes a free kick for a foul on Kevin Nolan. Mike Williamson restarts play with the free kick. 66:35 Shot by Jonas Gutierrez from outside the box goes over the target. 66:04 Corner from the right by-line taken by Danny Guthrie, Stephen Wright manages to make a clearance. 65:54 Andrew Carroll takes a shot. Richard Wood gets a block in. 64:15 Kevin Nolan takes the direct free kick. 64:15 Substitution Aron Gunnarsson is brought on as a substitute for Gary Deegan. 64:15 Foul by Stephen Wright on Peter Lovenkrands, free kick awarded. 63:35 Kevin Nolan produces a right-footed shot from just outside the penalty box that misses to the left of the goal. 62:50 Inswinging corner taken by Danny Guthrie from the left by-line played to the near post, clearance made by Richard Wood. 60:27 Substitution Freddie Sears comes on in place of Clinton Morrison. 59:19 Free kick awarded for a foul by Peter Lovenkrands on Stephen Wright. Sammy Clingan restarts play with the free kick. 58:17 Leon Barnett concedes a free kick for a foul on Andrew Carroll. Danny Guthrie takes the free kick. 57:38 The assistant referee flags for offside against Jonathan Stead. Free kick taken by Steve Harper. 55:48 Wayne Routledge takes a shot. Gary Deegan gets a block in. 55:03 Substitution Jonathan Stead joins the action as a substitute, replacing Freddy Eastwood. 55:03 Corner taken short by Danny Guthrie. 54:51 Centre by Jonas Gutierrez, clearance made by Richard Wood. 53:56 Foul by Carl Baker on Jonas Gutierrez, free kick awarded. Free kick taken by Jonas Gutierrez. 52:40 Assist on the goal came from Kevin Nolan. 52:40 GOAL - Andrew Carroll:Newcastle 2 - 1 Coventry Andrew Carroll finds the back of the net with a headed goal from inside the six-yard box. Newcastle 2-1 Coventry. 51:31 The assistant referee signals for offside against Jonas Gutierrez. Keiren Westwood takes the free kick. 48:57 Free kick taken by Wayne Routledge. 48:57 Booking Leon Barnett goes into the referee's book. 48:52 Leon Barnett concedes a free kick for a foul on Andrew Carroll. 47:35 Corner from right by-line taken by Danny Guthrie. 45:00+0:58 The whistle is blown to end the first half. 44:46 Jonas Gutierrez takes a shot. Richard Wood gets a block in. 44:02 Wayne Routledge fouled by Martin Cranie, the ref awards a free kick. Danny Simpson takes the free kick. 42:24 Peter Lovenkrands is ruled offside. Keiren Westwood restarts play with the free kick. 41:38 Jonas Gutierrez is penalised for a handball. Keiren Westwood restarts play with the free kick. 41:27 Patrick Van Aanholt crosses the ball. 39:08 The ball is crossed by Stephen Wright, save made by Steve Harper. 36:37 GOAL - Wayne Routledge:Newcastle 1 - 1 Coventry Wayne Routledge scores a goal from a long way out to the bottom left corner of the goal. Newcastle 1-1 Coventry. 36:20 Short corner taken by Danny Guthrie. 36:11 Andrew Carroll sends in a cross, clearance made by Richard Wood. 35:14 Free kick awarded for an unfair challenge on Wayne Routledge by Martin Cranie. Direct free kick taken by Wayne Routledge. 34:01 Assist on the goal came from Michael McIndoe. 34:01 GOAL - Clinton Morrison:Newcastle 0 - 1 Coventry Clinton Morrison grabs a goal from inside the penalty box to the bottom right corner of the goal. 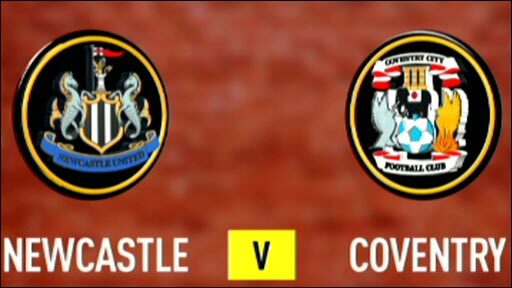 Newcastle 0-1 Coventry. 32:23 Free kick awarded for an unfair challenge on Sammy Clingan by Danny Guthrie. Sammy Clingan takes the direct free kick. 29:23 Danny Guthrie takes a outswinging corner from the right by-line to the near post, Shot from close range by Fabricio Coloccini misses to the right of the goal. 28:26 Danny Guthrie fires a strike on goal direct from the free kick, blocked by Leon Barnett. 28:26 Booking Caution for Stephen Wright. 28:15 Unfair challenge on Peter Lovenkrands by Stephen Wright results in a free kick. 26:40 Short corner worked by Andrew Carroll. 26:34 Centre by Jonas Gutierrez, clearance made by Richard Wood. 25:30 Centre by Michael McIndoe, save made by Steve Harper. 23:49 Gary Deegan takes a shot. Save by Steve Harper. 23:10 The ball is delivered by Danny Simpson, Keiren Westwood makes a save. 21:38 Mike Williamson challenges Leon Barnett unfairly and gives away a free kick. Keiren Westwood takes the direct free kick. 20:53 Direct free kick taken by Danny Guthrie. 20:53 Booking Booking for Gary Deegan. 20:41 Gary Deegan concedes a free kick for a foul on Andrew Carroll. 19:18 Outswinging corner taken from the right by-line by Danny Guthrie. 18:43 Corner from the right by-line taken by Danny Guthrie, Andrew Carroll takes a shot. Blocked by Richard Wood. 17:07 Danny Simpson produces a cross, clearance by Richard Wood. 16:30 Foul by Jonas Gutierrez on Stephen Wright, free kick awarded. Stephen Wright takes the free kick. 15:42 Danny Guthrie takes the inswinging corner, Fabricio Coloccini has a headed effort at goal from close in which goes wide right of the goal. 15:29 A cross is delivered by Danny Guthrie, clearance by Stephen Wright. 13:05 Inswinging corner taken right-footed by Danny Guthrie from the left by-line, Header from close range by Mike Williamson misses to the right of the goal. 12:54 The ball is delivered by Michael McIndoe, save by Steve Harper. 11:54 Foul by Freddy Eastwood on Fabricio Coloccini, free kick awarded. Direct free kick taken by Steve Harper. 10:31 Free kick awarded for a foul by Sammy Clingan on Patrick Van Aanholt. Fabricio Coloccini takes the direct free kick. 9:36 Danny Simpson produces a cross. 9:05 Fabricio Coloccini fouled by Freddy Eastwood, the ref awards a free kick. Kevin Nolan restarts play with the free kick. 8:30 Wayne Routledge crosses the ball. 6:36 Corner from left by-line taken by Danny Guthrie. 6:15 Jonas Gutierrez crosses the ball, Peter Lovenkrands takes a shot. Save by Keiren Westwood. 3:46 Clinton Morrison produces a drilled left-footed shot from just inside the penalty area and strikes the post. 3:07 Inswinging corner taken by Carl Baker from the right by-line. 0:34 Sammy Clingan takes a shot. Steve Harper makes a save.